Where do you eat your Reese’s? 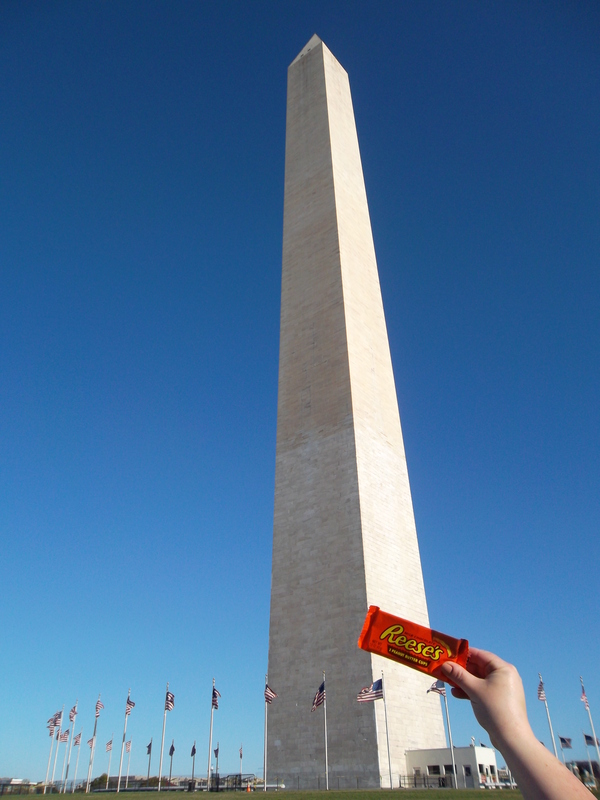 Princess and I went to Washington, DC, to find the perfect place to eat a Reese’s Cup. 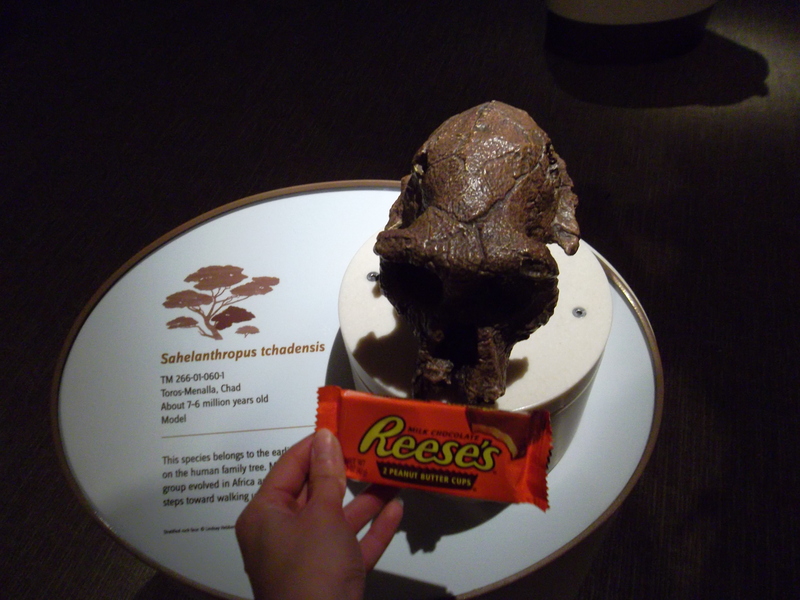 Little did I know “The Reeses” (I named him.) is afraid of heights. 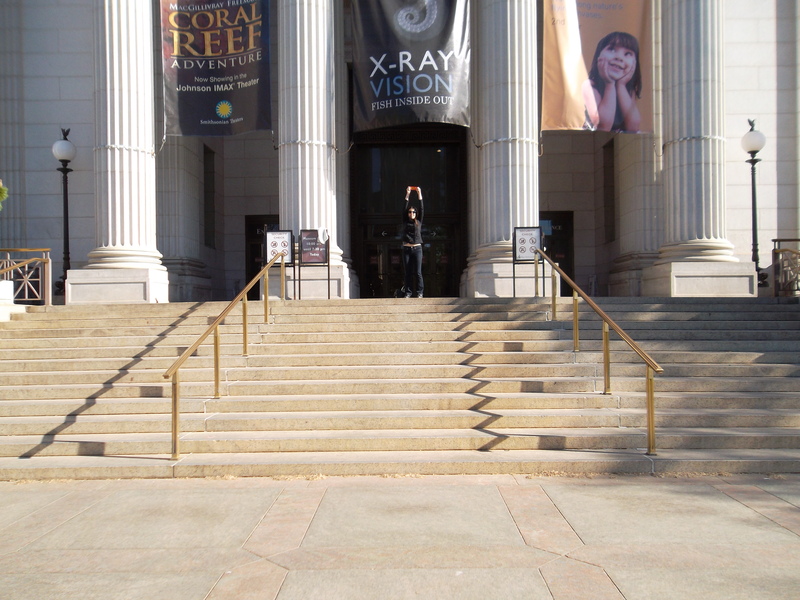 So we headed over to the Natural History Museum. I was about to bite into The Reeses, but the little cup said his last dying wish was to see the dinosaurs. So we went inside. Velociraptors are allergic to chocolate. That's how this guy died. 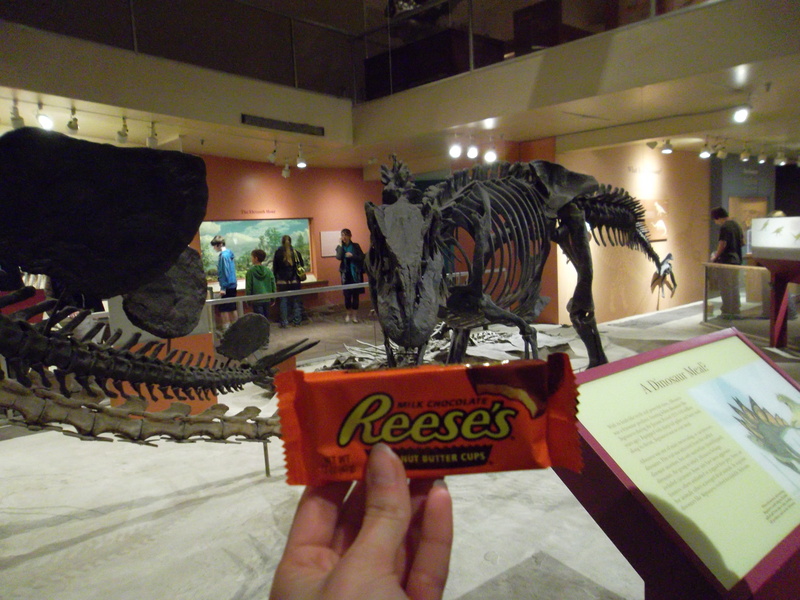 This dinosaur totally tried to swipe the Reeses…and so did this guy. After that close call, The Reeses tried to run away. But he’s not very good at blending in. 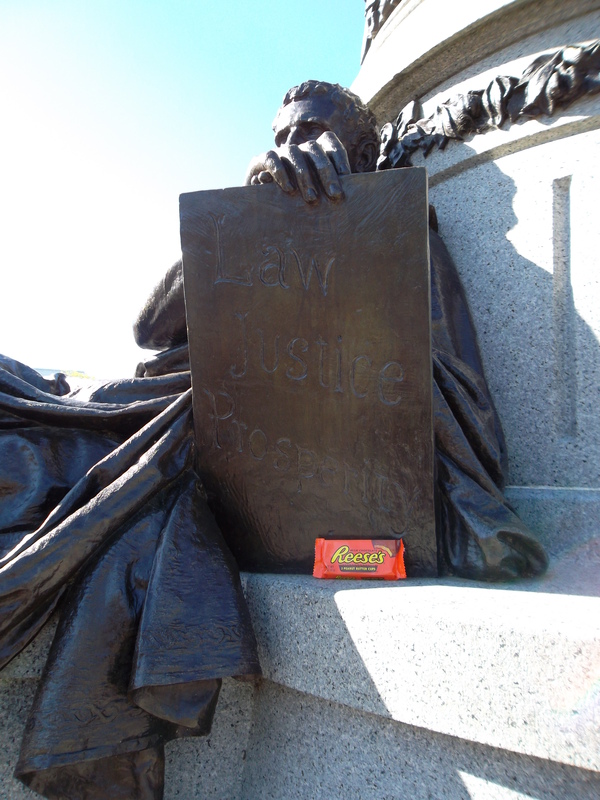 After all that walking, I had quite an appetite, so The Reeses and I had to part ways in front of the Capitol Building. I miss that little guy already. On this historic day, 19 of your favorite humor bloggers are staging a WordPress coup. We have banded together to address the important topic of Better Living Through Reese’s Peanut Butter Cups. Yes, you read that right. We are all presenting the same topic, each from his or her particularly unique perspective. Check out the other blogs participating! This entry was posted on Wednesday, April 11th, 2012 at 7:01 am	and tagged with Chocolate, Dinosaurs Are Allergic to Chocolate, Food, Humor, Life, Princess, Travel and posted in Travel. You can follow any responses to this entry through the RSS 2.0 feed. Haha you guys are crazy and I love it!! heh heh heh I love that The Reese’s got to live out his dying wish. You are so noble. Well done … RPBC is a good travel companion. I was wondering when I see multiple posts in my inbox with the same title. Great idea. It was all Peg’s idea! That’s hilarious! Every picture with the Reeses! Not only is he bright orange, he has an aroma, too. See, I would never hold out my Reese’s like that in a public place or with my kids present. I’d never get to eat one again. Excellent photos! I got Princess her own pack, so she had her own and wouldn’t want mine. I’ve never thought of actually giving my kids one of their own. Hmm….I’ll have to try that! It’s gonna take a lot of willpower from me though. Two candies everyone loves that I can’t stand: Reese’s Cups and Oreos. I have no explanation as to why. They have a horrid texture. Have you tried dunking them in hot chocolate? Yes. It still doesn’t matter. There’s just something about Oreos (or even the generic knockoffs) that I can’t stand. I have to admit I usually don’t like mixing chocolate and PB, but I’m ok with an occasional Reese’s. Hmmm, I am on WordPress and did not hear of this challenge. Now I’m sad. 😦 I feel like that dorky kid that nobody wants to eat lunch with. Again. Maybe I’ll go eat a Reeses to cheer myself up. Love the pics. And I’ve heard Neanderthals are infamous peanut butter hounds, so it was good that you got away from that place and enjoyed some alone time with The Reeses. And your belly. Peg just picked 18 blogs and 18 of the main tags. Don’t worry, we still love you. Are you going to use his frequent flier miles? Thoughtsy, you are such an intellectual! Always searching for more, more, more geography and such-like stuff. You should have left the wrapper by Neandrathal – proof that early man was more savvy than we suspected. Woot, woot, woot – we did it, we did it, hey, hey, hey! Nice idea and thanks for organizing it, Peg! This is a very good week for Reeses, especially with all of their peanut butter Easter eggs being on sale. I know! But when I went to the grocery store, they were already out. So glad you gave The Reese a nice send-off! He deserved it. You are all so clever…keep it up!! I think that’s why all the dinosaurs died. Chocolate overdose. I almost couldn’t eat him. Almost. Oooo..what kind? Plain? Peanut? Coconut? I did not know that about velociraptors and chocolate. Learn something knew every day! Yep. They’re just like dogs: allergic to chocolate. But they were ok with the peanut butter, they took their pills by hiding them in pb, just like dogs. LOL I love this post! I’m going to go check out the others! Thanks! Hope you enjoy the others! I know you miss him, but try to take comfort in the fact that part of him will always be with you. Yes, you’re right. He’ll always be on my thighs. At least he was well traveled and even cultured before his brutal passing. I tried to expose him to as much of DC as I could. Ohhhh you are a strong woman for lasting through all these locations before eating this luscious chocolate/pb treat! Email, I mean. Email about your posts. I like seeing DC from the Reese’s peanut butter cup p-o-v. Nice work! This post reminds me of The Hershey Factory that used to be right outside my city. I remember going as a child and getting lots of Reece peanut butter cups at the end of the tour. At least he went out in style. And your self-denial until the end of your mission was mighty impressive. Love this post! The world really is a better place because of Reese’s. Hey!! Are you a local? We live in Burke, VA. 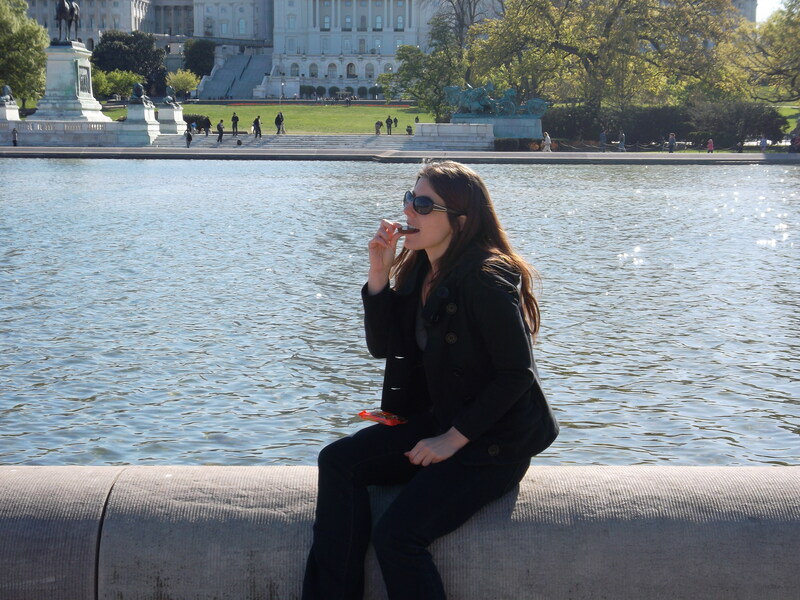 I loved the dinosaurs and the tour of DC–we were down there on the week of the 17th for the marathon. I am in the DC metro area. Hence the easy last-minute access to the Mall. You ran the marathon? Awesome! I can barely do a 5k. He had to have seen it coming….great post, thanks for the smiles. Aw, I miss The Reeses too. By the end of this post, as I got to know him and watch him on his vacation, he became like family to me. Except more famous. I was already googling to see if he’d appear on The View soon, perhaps Celebrity Apprentice. Sigh. A life cut short. I really do miss him. I got attached, too. I almost couldn’t eat him. Almost. Haha, this post is hilarious! I don’t often eat things with peanuts in as the boyfriend’s allergic. Every time he goes away for a few days I buy a giant bag of peanut M&M’s and scoff the lot. Mmmm. You are very well behaved. I don’t think the Reese’s would have made it out of the shop if he was travelling with me! I am glad that you gave your Reese’s a proper send off before swallowing it!